He's to be treated just like any other pupil. Remember how much fun it was to have a best friend in elementary school? Maybe you sat beside each other on the bus, or shared your lunch with each other, or played Pogs (remember those??) at recess. But if you're Prince George — and his classmates — you aren't allowed to have a best friend, at least, not at his new school Thomas's Battersea in South London. 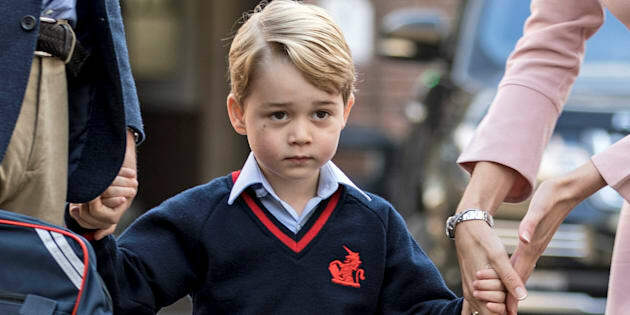 The third-in-line to the throne started school there just last week — looking adorable, we might add — and although we're sure there are plenty of kids who want to be besties with the wee royal (not to mention parents who want to set up playdates), he won't be picking a best pal anytime soon. According to Harper's Bazaar, Jane Moore, a panelist on the U.K. talk show "Loose Women," noted last week that Thomas's has a policy that discourages its pupils from having a best friend. Moore, who lives close to the school and has friends whose children attend it, said: "There are signs everywhere saying 'be kind' — that's the ethos of the school. "They don't encourage you to have best friends." The policy is one that's become more common in recent years, particularly at private schools. As the New York Times reported in 2010, these friendships are discouraged because they might make others feel left out. "[The] bottom line is that if we find a best friend pairing to be destructive to either child, or to others in the classroom, we will not hesitate to separate children and to work with the children and their parents to ensure healthier relationships in the future," said Jan Mooney, a psychologist at Manhattan's Town School, to the paper. Moore also revealed that if a child at the school is throwing a birthday party, they aren't allowed to hand out invitations in class unless every child is invited. "I think [it] is quite a good thing as you don't feel excluded," she said. I think [it] is quite a good thing as you don't feel excluded. The idea behind these policies is that no child feels left out, and prevents potential bullying. And according to dad Prince William, George is enjoying his time at school — so far. "George has been really easy. He hasn't said, 'Have I got to do this for the rest of my life?' George rules the roost but Charlotte's not far behind," Will told Aintree University Hospital patient Teresa Jones this week. "We are all seeing how long that lasts before he doesn't want to go!" he admitted. But it hasn't been all smooth sailing at the private school. On Wednesday, a 40-year-old woman was arrested and held in custody after trying to break into the school. "The arrested woman was taken to a south London police station where she remains in custody. We are working with the school, which is attended by His Royal Highness Prince George, to review its security arrangements after the incident," the Metropolitan Police said in a statement. A Kensington Palace spokeswoman added: "We are aware of the issue but we would not comment further on security matters."